mit denen von Skulptur und Malerei anhand eines generativen, materiellen Prozesses zu verbinden. „Maelstrøm“ ist ein innerer Spiegel der Realität, in dem Wahrnehmung und Traum, das Sichtbare und Unsichtbare, das Imaginäre und das Materielle zusammenkommen. Gefördert durch: Communauté francaise de Belgique Arts Numérique und Österreichisches Bundesministerium für Unterricht, Kunst und Kultur. “Maelstrøm“ is an installation and a sculptural process inspired by Edgar Allan Poe's short story “A descent into the Maelstrøm.“ Psychoanalysis, x-rays, and the cinema have redirected our gaze from things and from ourselves into the interior. However, interior phenomena are difficult to observe because we are either precisely at the center of observations or outside. This is similar with natural phenomena which are either too complex or too frightening to perceive them completely. 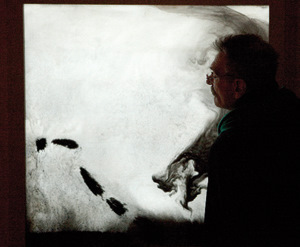 “Maelstrøm“ attempts to take on both of these perspectives at just the point where things start to become unclear and foggy, when inside and outside world begin to become indistinct, when the flow of information, images, sounds, narratives becomes too large and material and form are no longer distinguishable from each other. Because that is precisely where we have arrived. The installation attempts to combine our experiences from the cinema with those of sculpture and painting with the help of a generative, material process. “Maelstrøm“ is an interior mirror of reality in which perception and dream, the visible and the invisible, the imaginary and the material come together. Sponsored by: Communauté francaise de Belgique Arts Numérique and Österreichisches Bundesministerium für Unterricht, Kunst und Kultur.